Manchester has been named the “home of squash” since the Commonwealth Games took place here in 2002. The programme since that day has grown in participation, structure, performance and engagement. The last six years has seen the strategy that was devised between Manchester City Council and England Squash and Racketball come to life and we have achieved some fantastic goals along the way. Our success over the years can be attributed to incorporating a whole-sport strategy, meaning that we have looked at every area of how to develop the sport and worked hard towards excelling in each area. Rather than being great at the on court coaching but really poor in clubs, we upskilled a network of volunteers and assistant coaches to help make progress in all areas. Schools was always our first point of call. With limited resources (coaches, money and courts, not too dissimilar to the story across the country) we selected the most appropriate schools in relation to distance to one of our four public facilities and two of our private clubs. From there we engaged schools into free six week coaching (ideally in one of our facilities rather than in the school – after all nothing sells squash better than having the real experience) with the understanding of either putting squash onto their curriculum or allowing us to deliver workshops on a quarterly basis. From here we would talent ID and fast track the players who showed the right personality/mental attributes into our academy or community sessions. The allure of major events that are staged in Manchester has always helped engage schools and their children into the sport too. With all sessions following a strict scheme of work we have been able to influence schools to add squash onto their curriculum. We currently have four high schools with squash as part of their syllabus and five primary schools engaged in a mini squash programme. This move by the schools shows how Manchester has embraced a love of squash across the city and how it has become a natural selection for pupils to want to play alongside the city’s love for football. Squash clubs either based at private facilities such as the Northern in Didsbury or Cheetham Hill, or our public facilities like the National Squash Centre or Moss Side Leisure Centre have been the life blood of squash across the city. These clubs have key volunteers that form committees that help support the work of Manchester Squash across the city. They help deliver and oversee our community sessions with the long-term vision for each junior player to attend the club’s academy and go on to play in local leagues and join the club as a member. These clubs also help in engaging new members through their adult community nights and introduction to squash and racketball sessions. Without the buy in from the clubs we wouldn’t have been to be as successful, that’s why from day one we introduced a Manchester Club/Leisure Centre committee so we could meet on a regular basis to share good practice. One of our longest and hardest working volunteers in Manchester is Brian Grimshaw (right). Brian won the National Volunteer of the Year award from ESR in 2013. Brian has helped the City of Manchester squash club based at the National Squash Centre strive over the years and has helped increase participation not only at a junior level but introducing many adults to his ever popular community nights. Every Tuesday Brian volunteers his time and has done so for several years to open the National Centre doors to the Manchester public. Brian spends three hours on a Tuesday facilitating match play, three-quarter court games and informal coaching. These sessions can reach up to 30-plus players on any given Tuesday. Brian’s passion and enthusiasm for squash has helped to engage more adults into the sport than ever before at the NSC. Volunteers such as Brian has been one of the key points to creating an everlasting development programme for the future. The Manchester Squash Academy is the icing on the cake for any enthusiastic squash coach. An abundance of talented players that come from a wide range of backgrounds across the city, all with their own unique story. The Academy has been producing nationally ranked players who have gone on to win national tournaments, become full time PSA players and acquire scholarships to colleges and universities. The Manchester Squash Academy was originally run by former professional squash player Nick Taylor and then taken over for a short period by Vicky Boswell (formerly known as Botwright). The Academy now operates at many different levels to help develop and fast track junior squash players performance as quickly and smoothly as possible. Juniors just starting out in the sport come into the academy through our mini squash programme and once they acquire basic skills and understanding of the game they move on to our little belters programme. These first two layers of the academy can be accessed at all of our facilities across the city. Once a player reaches a certain level or shows a certain set of mental skills or psychological attributes we bring them into the NSC and they enter our “Manchester Potentials” programme, then the most dedicated players move onto the prestigious Manchester Academy. Once a part of the academy a fully periodised plan for each athlete tailored to their individual areas of development is set up and we work towards achieving their potential. One part of the Academy that we pride ourselves on in Manchester is our focus on talent selection in schools, clubs or in any of our junior programmes. We select players to enter our academy based around their mindset. Rather than selecting children who have physically developed earlier or quicker than other children and therefore can hit the ball harder, we focus on children who show resilience, a hardworking mindset and who have a good “coachability”. Children who can problem solve, deal with feedback, work hard, and have mental stamina/toughness. All attributes that top athletes possess. One of the most unique and exclusive advantages of having our development programme based in and around the National Squash Centre is the abundance of professional events. 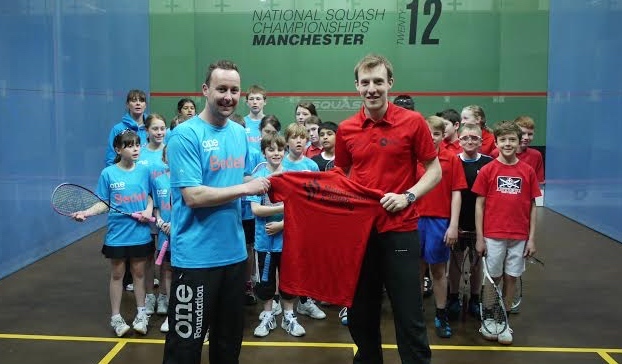 Since the Commonwealth Games took place in Manchester in 2002, where Peter Nicol and Lee Beachill won gold for England in the men’s doubles, Manchester City Council, under the guidance of keen squash enthusiast Yawaar Abbas, have driven forward the squash events in Manchester. Manchester hosts the prestigious National Squash Championships, every year which has become a regular fixture for all squash spectators and players. Yawaar is highly regarded as being the driving force for other major events such as the 2013 Men’s World Championships in Manchester and the now regular British Grand Prix, which has been driven forward by Paul Walters and the generous and passionate contributions of sports enthusiast AJ Bell. 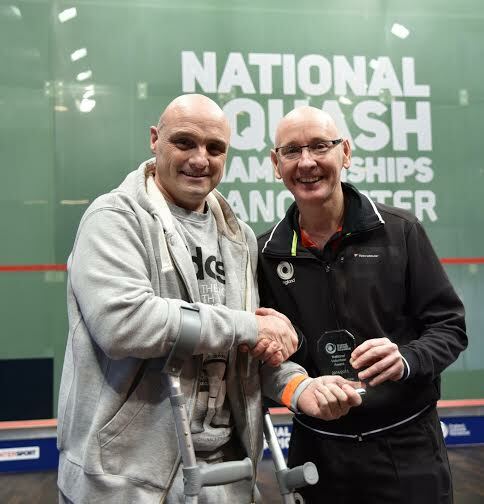 These events have been fundamental to the development of Manchester’s squash success. Juniors and club/leisure centre players get access to world-class squash on their doorsteps. It also allows Manchester to bring together clubs, volunteers and rewards and encourages them to continue to grow and one day produce Manchester’s own World Champion. These major events also help bring publicity and sponsorship to the programme and a platform to help increase local participation.